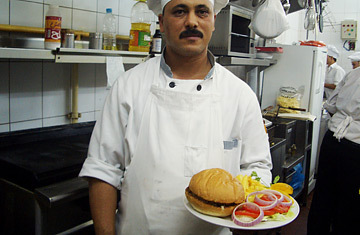 The head chef at Lucille's Restaurant in Cairo, Egypt shows off their famous hamburger. .
Having spent a lot of my journalistic life in Cairo, I'm fond of Egyptian food. The garlic-spiced mashed fava bean dish called ful medames, for instance, which we eat for breakfast, lunch or dinner. My teenage daughter repudiated McDonald's after seeing Supersize Me, so when she's out with her friends, they go to a local hangout known for its kushari, a spicy mix of macaroni, rice, chick peas and lentils. Still, I have to admit that when it's lunchtime, I usually head for Lucille's, a humble American-style greasy spoon in the Maadi district of Cairo that may serve the tastiest burger in the world. Don't let me distract you from your Fourth of July barbecue; but yes, a family restaurant in Egypt dishes up the best burger I've ever eaten, and I'm not the only one who thinks that way. One of owner Lucille Crooks's thrills came the day she witnessed a young American backpacker talking and smiling to his burger as he alternately beheld it and munched on it. "That tickled me, he was enjoying it so much," Lucille recalls. "He wasn't expecting to find a real hamburger in Egypt, and not one that good." We're not talking about a chi-chi burger like you might order at, say, Vert, Wolfgang Puck's fancy brasserie in Hollywood, where the lunchtime Prime Cheese Burger is topped with grilled onion, lettuce, tomato, "aged" cheddar and remoulade (look it up, but basically it's mayonnaise). The burgers on Lucille's menu are the classics  a dozen variations on a generous 4/10th of a pound beef patty with lettuce, tomato and onion on the side. The menu also has American staples like vegetarian salads, cheesecake and iced tea, as well as Tex-Mex offerings, an echo of Lucille's years at Rosita's, a family-owned Mexican restaurant in Barstow, Calif.
What makes all the difference at Lucille's is not the size but the taste: a fluffy, sweet and slightly toasted bun leads the taste buds to a slab of juicy ground beef that is a little crunchy on the outside where the meat was seared on the grill. The cheeseburger, my usual, gets a brush of Hellman's mayo and a slice of imported Australian cheddar cheese. When I asked general manager Essam Mabrouk the secret of the burgers, it turned out there is indeed a special ingredient, which is lathered on the beef patty as soon as it hits the heat. (He hinted it has something to do with fish, but refused to divulge more.) Mabrouk hauled me into the kitchen to show me some other reasons for Lucille's success: fresh, organic ingredients. Six kitchen butchers double-grind ultra-lean round and rump steaks, mixing in a secret ratio of "clean" fat, and then double-press the patties in a mold to ensure cooking consistency. The lettuce, tomato and onions are grown in the Nile River basin's year-round sunshine, requiring no preservatives. "It really boils down to the fact that it's all homemade," Lucille tells me. "We've gone back to basics. I don't throw anything in the grinder that doesn't belong there." But the real secret of Lucille's success is Lucille, 48, who comes off as a sort of Erin Brockovich character. An Air Force brat, she waitressed nights while raising three kids, hop-scotched around the world for her ex-husband's career and eventually accomplished a remarkable feat: starting and running a successful business, as an American  and as a woman, no less  in an Islamic country. After selling cupcakes to fellow expats in Cairo, she and an Egyptian friend opened a restaurant only to see the business and the friendship go bust. She hung on, learned Arabic and read the Koran to better understand the culture and in 1996 sank every penny into launching Lucille's, a cozy place with 13 booths and tables. One of her rewards is that she may be about to go regional if not global; lately, investors have been clamoring to franchise Lucille's all over the Middle East. None of this was any easier after 9/11 and the Iraq war, which suddenly made the hamburger a symbol of Yankee imperialism. For a while, McDonald's was shaken by the anti-American sentiment, which took the form of picketing, boycotts, vandalism and decreased sales. (However, since McDonald's in Egypt went 100% locally owned, sales have soared to nearly 10 million burgers a year at its 50 outlets.) Lucille's slowed down but with a staff of 46 Egyptians and her son Jason, a former Denny's manager, has been winning back Egyptian hearts and minds one burger at a time, on average 200 a day. It started out as a hangout for Americans, such as the couple that ate here nearly every day in the same booth for five years; when they left, Lucille put a bronze plaque in their honor over the table ("Frank & Angela, Home Away From Home"). Now 70% of Lucille's customers are Egyptians, who appreciate that she makes a point of not serving alcohol or pork and observing halal meat-slaughtering practices. "I haven't tried burgers in the U.S., but this is the best one in Egypt," Randy Banna, a 25-year-old Cairene, agreed when I leaned over from my table to ask how he liked his cheeseburger. "It's not fast-food, where they cook it fast and you eat it fast. Here it's totally different." The culture clashes at Lucille's tend to be comical: Egyptian customers had a hard time understanding that a chicken-fried steak is a piece of beef, not poultry. On Independence Day, I'll be having a cheeseburger at Lucille's  but without Lucille. She's on vacation in Colorado, where she'll be flipping burgers on the barbecue, insisting it won't be the same. "When I'm away, I miss Cairo," she explains. "I miss the people, I miss my life, I miss my food. I've been eating at that restaurant myself for more than 10 years." Lucille, hurry back.